Affinity and dose of T cell receptor (TCR) interaction with antigens govern the magnitude of CD4+ T cell responses, but questions remain regarding the quantitative translation of TCR engagement into downstream signals. We find that while the response of mouse CD4+ T cells to antigenic stimulation is bimodal, activated cells exhibit analog responses proportional to signal strength. Gene expression output reflects TCR signal strength, providing a signature of T cell activation. Expression changes rely on a pre-established enhancer landscape and quantitative acetylation at AP-1 binding sites. Finally, we show that graded expression of activation genes depends on ERK pathway activation, suggesting that an ERK-AP-1 axis plays an important role in translating TCR signal strength into proportional activation of enhancers and genes essential for T cell function. T helper cells recognize and respond to bacteria, viruses and other invading microbes and thus play a central role in the adaptive immune system. These cells have a receptor on their surface that binds to fragments of proteins – known as oligopeptides – from the microbes that have been digested and presented on the surfaces of other immune cells. Once active, T helper cells multiply, grow and release signals that regulate genes in other cells to promote immune responses. Previous studies suggest that a T helper cell’s response is binary – that is, either on or off. However, this does not explain how the strength of the T cell response to infection can vary. Allison et al. used a technique called high-throughput sequencing to examine the activity of genes in T helper cells from mice that had been genetically engineered to only produce one type of T cell receptor. For the experiments, the T cells were exposed to various concentrations of different peptides known to bind either well or poorly to the receptor. Allison et al. found that, once activated, the response of an individual T cell was not binary, but instead was related to the strength of the signal it received through its receptor. Further experiments showed that although a subset of the genes activated in T helper cells do respond in a binary fashion, the activities of many other genes involved in immune responses and cell metabolism were related to the strength of the signal from the receptor. This “analog” gene activation depends on the level of activity of the MAP kinase signaling pathway. Together, Allison et al.’s findings help us to understand how T cells are able to fine-tune immune responses to invading microbes. The next challenge will be to investigate the mechanisms underlying binary and analog gene activity in T cells. The question of how the T cell receptors (TCRs) of CD4+ T cells respond to ligands of differing affinities and concentrations with such remarkable specificity is of great interest to the study of immunity. The TCR binds to antigen presented by the molecules encoded by the Major Histocompatibility Complex (MHC) such that strength of the TCR signal in response to a particular peptide-MHC complex (pMHC) is dependent on all three components– the antigenic peptide, the MHC, and the TCR itself (Heber-Katz et al., 1982). Variations in signal efficiency are thus caused by the generated TCR sequence (Hedrick et al., 1984; Jerne, 1971), genetic differences in MHC (Heber-Katz et al., 1982; Hedrick et al., 1982), and the peptide being presented (Solinger et al., 1979). Even small differences in the number or affinity of these pMHC-TCR interactions are read by the TCR and have important consequences for the nature and extent CD4+ T cell activation; high-affinity interactions lead to inflammatory responses at a lower concentration of antigen, increased Interleukin 2 (IL2) and IFNγ production, and increased proliferation (Heber-Katz et al., 1982; Hedrick et al., 1982; Solinger et al., 1979; Alexander, 1993; Rogers and Peptide dose, 1999; Rogers et al., 1998; Sloan-Lancaster et al., 1993; Tubo et al., 2013), whereas lower affinity interactions can lead to incomplete phosphorylation of downstream signaling complexes (Kersh et al., 1998b; Sloan-Lancaster et al., 1994), anergy (Sloan-Lancaster et al., 1993, 1994), or TCR antagonism (Alexander, 1993; Kersh et al., 1998b). The precise result of low-affinity engagement varies with experimental conditions, but in each case, a cellular phenotype distinct from high-affinity engagement is produced. There exists a well-characterized model system for studying the effects of ligand affinity on CD4+ T cell activation: the AND mouse is a strain with a transgenic CD4+ T cell TCR (Kaye et al., 1989). This TCR recognizes pigeon cytochrome c (PCC) along with synthetic and species-variant cytochrome c oligopeptides (Solinger et al., 1979; Rogers and Peptide dose, 1999; Rogers et al., 1998). Notably, though many of the peptides differ from PCC by a single amino acid, the effects of TCR recognition of the peptides vary greatly. Kinetic parameters and cytokine output of the interaction with many cytochrome c peptides and their analogues have been described (Rogers and Peptide dose, 1999; Rogers et al., 1998). Differences in microcluster formation at the membrane have likewise been described (Varma et al., 2013). These variable responses to ligands of differing affinity are especially interesting in the context of the digital TCR response. TCR responses have been characterized as digital (Coward et al., 2010)—that is, signaling downstream of the TCR is either all-on or all-off, such that a given T cell must either be committed to a full response or to no response. Previous work has established this switch-like behavior as observable in terms of extracellular markers such as CD69 (Das et al., 2009; Daniels et al., 2006), ERK pathway component localization (Das et al., 2009; Daniels et al., 2006; Prasad et al., 2009), NF-κB activation (Kingeter et al., 2010), NFAT localization (Marangoni et al., 2013; Podtschaske et al., 2007), cell-cycle entry (Au-Yeung et al., 2014), and cytokine production (Podtschaske et al., 2007; Huang et al., 2013). As a result, differences in the magnitude of responses to ligands of varying affinity would be attributed to greater frequencies of T cells responding at the population level, rather than per-cell variability (Au-Yeung et al., 2014; Huang et al., 2013; Zikherman and Au-Yeung, 2015; Butler et al., 2013). Still, some aspects of the TCR response have been described as analog, or varying in proportion to the strength of signaling: CD3ζ chain phosphorylation (Kersh et al., 1998a; Sloan-Lancaster et al., 1994; Daniels et al., 2006; Kersh et al., 1999; Kersh et al., 1998a); Zap70 activation (Daniels et al., 2006; Prasad et al., 2009); intracellular calcium concentrations (Irvine et al., 2002); expression of the transcription factor IRF4 (Man et al., 2013; Nayar, 2014); and cell division time (Marchingo, 2014). It is unclear how these analog components of the TCR response fit in to a digital model. Both the ability of the TCR to discriminate with high resolution between ligands and the digital nature of TCR signaling have been extensively studied at the level of signaling. Downstream of the TCR, a number of signaling pathways govern the molecular response to engagement, allowing T cells to grow, divide, and acquire immune effector functions consistent with the inciting stimulus (Murphy and Blenis, 2006; O'Sullivan and Immunology, 2015; Proud, 2007; Santamaria and Ortega, 2006; Wang and Green, 2012). AKT and PKCθ interact at the cell membrane and jointly serve to induce nuclear translocation of the pro-inflammatory transcription factor NF-κB, which in turn is able to activate target genes (Huang and Wange, 2004). In particular, AP-1, which comprises homo- or heterodimers assembled from proteins of the Fos, Jun, and ATF transcription factor families (Murphy et al., 2013), requires both TCR and co-stimulatory signaling (Rincón and Flavell, 1994), and it is usually activated by the Ras/Raf/Mek/Erk pathway (Murphy and Blenis, 2006; Schade and Cutting edge, 2004). At least four feedback loops have been identified in thymocytes and peripheral T cells downstream of the TCR (Coward et al., 2010; Feinerman et al., 2008). Collectively, these feedback loops serve to enforce a digital response by either dampening sub-threshold signaling or amplifying above-threshold signaling, resulting in T cell responses that are all-off or all-on, respectively. Despite these insights into the signaling pathways downstream of TCR activation, there is little known about the transcriptional programs that determine the distinct phenotypes resulting from high- versus low-affinity stimulation. In this study, we address the question of affinity at the level of the chromatin. We take advantage of the PCC system to assess the effects of varying the dose and affinity of peptide presentation to CD4+ T cells on enhancer formation and gene expression, giving us a genome-wide picture of how TCR signaling is able to achieve such highly specific responses despite its apparent digital signaling pattern. We find first that the digital/analog dichotomy is too simple, and instead CD4+ T cells respond to ligands of varying dose and affinity by modulating both the frequency of responding cells and the level of activation of responding cells at a single cell level. In other words, activation markers are analog with respect to the strength of TCR signaling when comparing across doses and affinities, but for any single dose and affinity, the overall signaling pattern is digital for the population of cells. We next show that at the population level, the combined effects of analog precision and increasing frequency of responder cells produce gene expression patterns that directly reflect the strength of TCR signaling for a set of activation signature genes. These gene expression patterns can be used to assess CD4+ T cell activation status, and we develop a tool for ranking arbitrary CD4+ T cell populations by activation score. Underlying these gene expression patterns, we find that the enhancer landscape is largely pre-existing, such that TCR engagement results in activation of primed enhancers rather than through selection of new enhancers. Finally, we show that the graded activation score and the expression of activation signature genes are dependent on the amount of phosphorylated ERK activity downstream of the TCR. Together, these results suggest that the degree of ERK activation translates the analog TCR signal resulting from varying the dose and affinity of TCR engagement into downstream gene expression programs. In order to understand the effects of the digital TCR response on the transcriptional landscapes of CD4+ T cells, we first sought to characterize the 'on-state' of the TCR response. CD4+ T cells and CD11c+ antigen presenting cells (APCs) were isolated from AND transgenic mice (Figure 1—figure supplement 1A,B) and co-cultured for 24 hr with one of a panel of previously described (Rogers and Peptide dose, 1999; Rogers et al., 1998) peptides at several different doses. Cell activation was then measured at a single cell level using flow cytometry. As expected, for each given peptide and dose, CD4+ T cells followed a digital pattern, appearing either all-on or all-off according to extracellular activation markers such as CD69 (Figure 1A) and CD25 (Figure 1B). Increasing the peptide dose or affinity significantly increased the percent of activated cells in the population (Figure 1C,D). However, when we compared across peptides and concentrations, it was clear that the activation level of the on-state cells was not 'all on.' Gating on CD69+ cells, each different peptide and different dose of a peptide achieved a different amount of CD69 per cell (Figure 1E). Gating on CD25+ cells yields similar results, with varying amounts of CD25 expressed per cell dependent on both the dose and the affinity of the stimulation (Figure 1F). Thus, while under a given condition the CD4+ T cells were either on or off as per classical digital signaling, when comparing across a panel of conditions, the activation level of the on-state cells is analog with respect to the strength of the TCR signal. Both frequency of responding cells and per-cell activation levels increase with increasing signal strength. In order to understand the effect of this variability genome-wide, we selected two peptides—the low-affinity K99A and the high-affinity PCC—and sequenced mRNA from CD4+ T cells exposed to both a low and a high concentration of each peptide. We compared the gene expression profiles at 24 hr across five conditions (no-peptide; low-dose, low-affinity (10 μM K99A); high-dose, low-affinity (100 μM K99A); low-dose, high-affinity (0.1 μM PCC); and high-dose, high-affinity (10 μM PCC)), four out of five of which displayed some degree of activation as measured by extracellular markers such as CD69 or CD25. We used principal component analysis (PCA) to determine the primary axes of variation across the approximately 3,000 genes that were expressed above ten reads per kilobase per million (RPKM) and at least two-fold different between any two conditions. A single principal component explained more than 99% of the variance in gene expression changes (Figure 2—figure supplement 1A). The first principal component ranks the samples according to what would be expected based on TCR signal strength and extracellular markers such as CD69 and CD25 (Figure 2A). As PC1 captured the gene expression changes concomitant with increasing activation, we extracted the most positive 10% and most negative 10% of the genes along PC1 to determine which genes were important for the axis. The 10% of genes contributing the most positive signal to PC1 were increasing in a generally graded manner with TCR signal strength across the samples, and the 10% of genes contributing the most negative signal were decreasing (Figure 2B; two-tailed p-values based on permutation testing of 2.9e-11 and 1.8e-28, respectively). RNA-Sequencing reveals graded expression of activation signature genes. Collectively, the most indicative 10% of genes for PC1 provide a multidimensional signal for ranking the samples in one dimension according to TCR signal strength and activation state of the CD4+ T cell; we therefore call these genes “activation signature genes.” Looking more closely at the genes in this group, we see many well-documented immune response genes such as Tbx21 (Tbet), Stat1, and Tnf (Figure 2C), all of which increase in a graded manner along with TCR signal strength at the population level. Irf4, previously reported to increase in expression in an analog manner downstream of the TCR on a per-cell basis (Man et al., 2013; Nayar, 2014), was also among the activation signature genes, and showed the same graded response pattern at the population level across the conditions (Figure 2D). Gene Ontology analysis yielded several enriched gene categories among the activation signature, including Myc targets, post transcriptional regulation of gene expression, MTORC1 signaling and response to cytokine and regulation of translational initiation (Figure 2E) exemplified by Eif3a (Figure 2—figure supplement 1B). Protein biosynthesis has been previously shown to be increased upon T cell activation, and here we see that many of the genes involved in increasing translational activity are themselves up-regulated in a manner that is proportional to the level of activation across the population (Beretta, 2004; Bjur et al., 2013). Another enriched ontological category was molecular chaperone genes that are responsible for protein folding and unfolding, including six of the Cct family of chaperones (for example, Cct2: Figure 2—figure supplement 1C) and five heat shock family members (for example, Hsph1) that increased with TCR signal strength. The graded increase of activation signature genes at the population level corresponded with single-cell increases in CD69 and CD25 protein, but it was unclear whether the graded response of proteins associated with activation signature genes was generalizable. In order to determine whether proteins derived from activation signature genes increased on a per-cell basis in more cases, we determined the per-cell protein levels of a panel of genes from the activation signature set with flow cytometry. Not all increases in mRNA levels were reflected at the level of protein (Figure 2—figure supplement 1D), but for those that were, the increases in mRNA resulted in increases both in the frequency of cells responding (data not shown) and in protein levels on a per-cell basis. This is exemplified by the expression of Tbet (Figure 2F), IRF4 (Figure 2G), CD200 (Figure 2—figure supplement 1E), Ly6a (Figure 2—figure supplement 1F), and Tnsf11 (RANKL; Figure 2—figure supplement 1G). To investigate whether graded levels of expression of activation signature genes seen at the RNA level was a reflection of per-cell activation levels or just the frequency of responder cells we conducted both RNA flow cytometry and RNA-seq for cells sorted by extracellular CD69 expression. RNA flow cytometry involves the hybridization of fluorescent probes to RNA targets within a cell, followed by analysis of per-cell fluorescence via flow cytometry. Thus, observed fluorescence intensity corresponds directly to single-cell expression levels of mRNAs of interest. Using this technique, we observed that mRNA expression levels of Irf4 increased across the five conditions on a per-cell basis in the same manner as seen at the population level and at the protein level (Figure 3—figure supplement 1A). For each population, the mean fluorescence intensities of Irf4 mRNA increased in the same manner as seen with population-level mRNA expression and single-cell protein levels (Figure 3A, Figure 3—figure supplement 1B). In contrast, beta actin mRNA as measured by this technique was constant under each treatment condition (Figure 3—figure supplement 1C,D). Thus, for some mRNAs, in addition to modulating the frequency of responding cells, peptide dose and affinity tune the strength of response to TCR signaling on a per-cell basis. Single-cell RNA levels reflect whole-population levels for a subset of genes. (A) RNA flow cytometry was used to determine the single-cell levels of RNA transcripts for Irf4 across the five peptide conditions. The mean fluorescence intensity of the Irf4 RNA probe increases across the five conditions assayed via RNA flow cytometry. Data is representative of two technical and two biological replicates. (B) Treated cells were sorted, and RNA-sequencing was performed on the CD69+ cells from each peptide condition such that the effect of responder frequency was controlled. PCA of the genes that changed between any two samples reveals that the primary axis of variation (PC1, shown along the x-axis) orders the four conditions that had any retrievable CD69+ cells by increasing TCR signal strength: low-dose, low-affinity (10 μM K99A); high-dose, low-affinity (100 μM K99A); low-dose, high-affinity (0.1 μM PCC); and high-dose, high-affinity (10 μM PCC). (C) As with the whole-population RNA-sequencing data, looking at the top 10% of genes along PC1 revealed an expression profile that reflects the analog signal seen with external activation markers such as CD25 and CD69. Each blue line represents a gene, with reads per kilobase per million (RPKM) normalized from 0 to 1 across the five conditions. (D) Gene Ontology (GO) analysis of the genes in the top 10% of PC1 shows enrichment for terms related to metabolic processes such as translation and RNA biosynthesis. (E) There was additionally a digital cluster of genes identified that showed threshholding behavior upon cell activation. For the digital cluster, expression levels were low in the control CD69- cells, and universally higher across all CD69+ samples. The peptide conditions are sorted along the x-axis, and the normalized RPKM for the 100 most highly induced/most consistently expressed genes in the cluster is shown along the y-axis. (F) GO analysis of the genes in the digital cluster shows an enrichment for terms related to immune signaling pathways. (G) RPKM levels for several genes classified as 'translation initiation factors' are shown. For most of the genes, expression is low for the CD69- control, and increases in an analog fashion across the CD69+ cells from each treated condition. The peptide conditions are sorted along the x-axis, and RPKM for each gene is shown along the y-axis. (H) RPKM levels for several genes in the 'ribosome biogenesis' GO category are shown. Expression is low for the CD69- control, and increases in an analog fashion across the CD69+ cells from each treated condition. The peptide conditions are sorted along the x-axis, and RPKM for each gene is shown along the y-axis. (I) RPKM levels for several genes indicative of the digital cluster are shown. Expression is low for the CD69- control, but relatively level across all CD69+ samples. The peptide conditions are sorted along the x-axis, and RPKM for each gene is shown along the y-axis. In order to look genome-wide, we conducted RNA-sequencing on CD4+ T cells treated as before, but sorted by the activation marker CD69, such that we selectively analyzed responder cells. In this way, we were able to control for the effect of frequency—the observed RNA-seq levels for each condition reflected only the activated cells, and thus were not diluted by non-responder cells. As with the whole-population RNA-seq, we used PCA to determine the primary axes of variation across the four samples for which CD69+ cells could be collected. (Insufficient responder cells could be retrieved from the no-peptide condition for sequencing.) Across the four treated samples, the first principal component again sorted the conditions according to the relative strength of TCR signaling (Figure 3B). Looking at the genes composing the top 10% of PC1, we saw, as with the whole-population RNA-seq, that gene expression patterns largely reflected the same trend, increasing with increasing TCR signal (Figure 3C, Figure 3—figure supplement 1E). To assess what genes made up the activation signature seen in PC1, we performed GO analysis on the genes in the top 10% of PC1. As with the whole-population data, genes associated with cell metabolic processes like translation and RNA biosynthesis were enriched (Figure 3D), indicating that the expression of genes in key cellular activation pathways increases with increasing TCR signaling on a per-cell basis as well as at the population level. In contrast to the whole-population data, there was a group of genes that were near maximally activated in CD69+ cells treated with the low concentration of K99A and exhibited similar expression across all treatment conditions. This ‘digital’ pattern is illustrated in Figure 3E for the 100 most highly induced/most consistently expressed genes and for representative genes in Figure 3—figure supplement 1F. GO analysis demonstrated that this digital cluster of genes was enriched for immune signaling terms (Figure 3F). Expression profiles for representative mRNAs in the translation initiation factor and the ribosome biogenesis groups are illustrated in Figure 3G,H and Figure 3—figure supplement 1E, and representative mRNAs in the digital group are illustrated in Figure 3I and Figure 3—figure supplement 1F. Thus, the graded increase in expression of activation signature genes at the population level is a reflection of both frequency of responding cells and incremental increases in expression levels on a single-cell level for at least a subset of genes, including key cellular metabolism genes. Given that PC1 was able to distinguish between the five conditions according to activation state, we extracted the genes from the top and bottom of the whole-population PC1 that were consistent across replicates to use as a general-purpose activation score able to correctly rank the five conditions by TCR signal (Figure 4A). 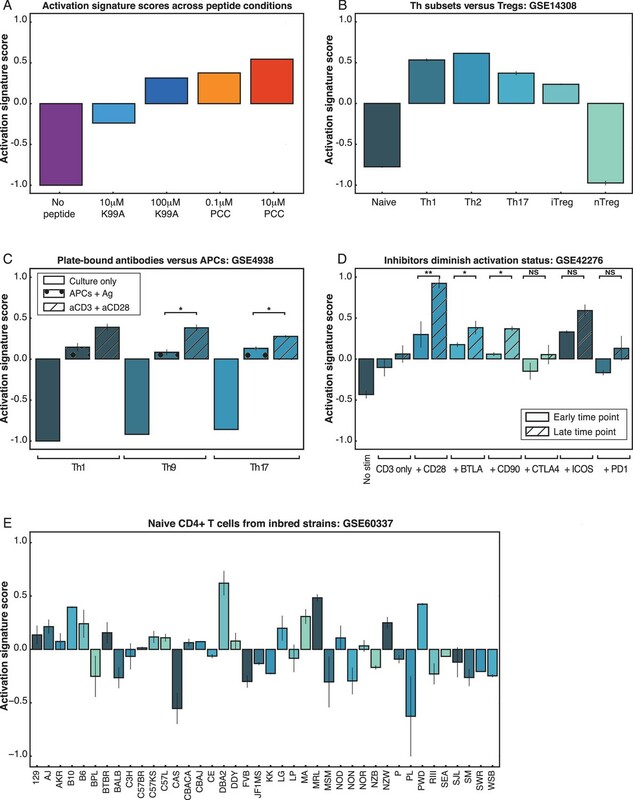 We compared samples from several publicly available datasets, and the activation score was able to quantitatively rank conditions within a given experiment set such that activated and naïve CD4+ T cells could be distinguished and further that the effects of various genetic perturbations of CD4+ T cell responses could be observed. For example, the activation score correctly recapitulated the findings that polarized helper subsets of CD4+ T cells were more pro-inflammatory than unstimulated cells or induced and natural regulatory T cells (Wei et al., 2009) (Figure 4B); that at the population level plate-bound anti-CD3 and anti-CD28 induced stronger activation signals than APCs plus antigen (Tan et al., 2014) (Figure 4C); that costimulation was important for achieving higher activation states but checkpoint inhibitors could block this effect (Wakamatsu et al., 2013) (Figure 4D); that knockout of Trim28, a molecule necessary for optimal IL2 production, diminished CD4+ T cell activation status (Chikuma et al., 2012) (Figure 4—figure supplement 1A); and that acute LCMV infection produced more robust activation in CD4+ T cells than chronic infection (Doering et al., 2012) (Figure 4—figure supplement 1B). PC1 can be used to rank arbitrary CD4+ T cell data sets. In order to test the value of the activation score, we used it to rank naïve CD4+ T cells from 39 inbred mouse strains (Mostafavi, 2014) (Figure 4E). The activation score quantified the variability in the isolated CD4+ T cells according to activation status, revealing that the genetic differences between the strains yielded different levels of activity even under unstimulated conditions. As would be predicted by known strain phenotypes, C57BL/6 cells were more activated than most strains, while BALB/c mice were less activated than most strains. The lupus-prone MRL strain and the type 1 diabetes-prone NOD strain had cells that ranked as relatively activated, whereas the type 1 diabetes-resistant NON strain had a relatively low activation score. The strain with the highest activation score, DBA/2, had top-quartile expression of more than half of the activation signature genes (p=7.4e-30 by chi-squared test). These included a number of immune effectors such as Irf4, Cd25, Il2rb, Nfkb1 (p105/p50), and Nr4a1 (Nur77), as well as 17 of 32 genes from the protein biosynthesis group and 5 of 12 genes from the molecular chaperone group. Differences in the immune phenotypes of the DBA/2 strain, such as resistance to malaria, have been largely attributed to B cell-dependent mechanisms (Bakir et al., 2006), but the activation score here indicates that naïve CD4 T cells from DBA/2 mice are skewed toward an activated phenotype. Three of four wild-derived strains had low activation scores: CAST, MSM, and WSB mice. All three of these wild-derived strains had bottom-quartile expression of the immune effectors Irf1, Irf8, Stat1, Nfkb1, and Tnf, indicating that these CD4+ T cells possess a less inflammatory gene expression profile under homeostatic conditions. Thus, the activation score serves as a widely applicable and quantitative measure of CD4+ T cell activity, and can be used to assess the relative activation status of a variety of CD4+ T cell samples. We have developed a publically available, open source tool (see Materials and methods) to facilitate the scoring and ranking of datasets by interested parties. 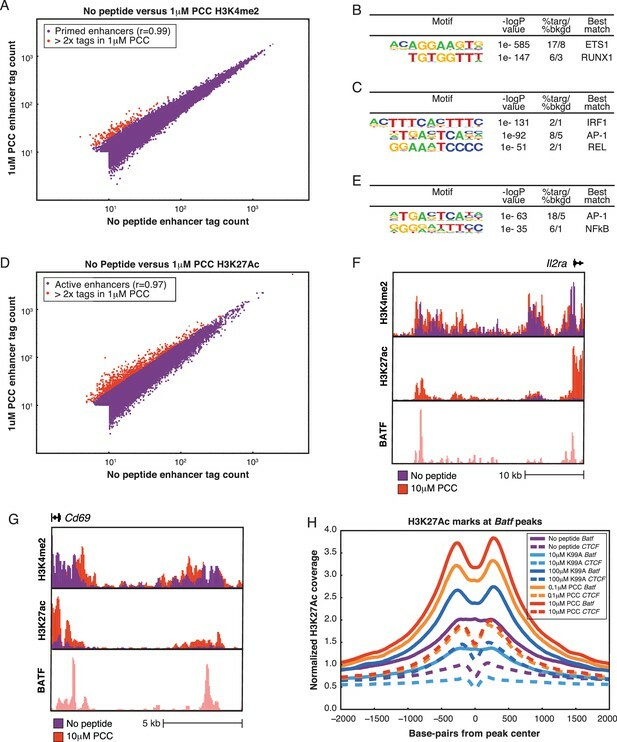 In order to better understand the changes in genome-wide expression patterns that occurred with TCR stimulation, we compared enhancer landscapes with and without stimulation. We first performed ChIP-sequencing for H3K4me2, a marker of primed and active promoters and enhancers (He et al., 2010; Kaikkonen et al., 2013), across the five conditions. By and large, the H3K4me2-marked regions across the five conditions were very similar (Table 1), with a comparison of tag counts associated with specific genomic regions under no peptide or 1 µM PCC illustrated in Figure 5A. Though there were some enhancers showing at least two-fold change in H3K4me2 tag counts across conditions, these regions were at the lower end of the tag count range and therefore differences were not significant (Figure 5A, red points). Thus, the gene expression and phenotypic changes seen after activation were not due to selection of new signal-dependent enhancers. Pairwise overlap between the H3K4me2 peaks. Each cell contains the count of overlapping peaks where each condition shown has at least 40 tags (normalized). In the diagonal is the total number of peaks with at least 40 tags for the given condition. Primed enhancers are pre-existing, but gain activation markers with treatment. (A) Comparing primed enhancers marked by H3K4me2 peaks reveals strong correlation between untreated and treated samples. Normalized tag counts in the No Peptide condition are plotted against those in a 1 μM PCC condition, with red dots coloring those that are more than two-fold up-regulated in the 1 μM PCC condition. The up-regulated enhancers are both few in number and low in tag count. (B) De novo motif finding identifies lineage-determining transcription factor (LDTF) motifs among primed enhancers shared by the five conditions. An ETS motif is most prominent, and a RUNX motif is likewise highly enriched over the randomly selected background. Both ETS and RUNX factors play important roles in T cell development. (C) Among primed enhancers shared by all five conditions, including the untreated condition, pro-inflammatory transcription factor motifs are enriched. An IRF family motif, AP-1 family motif (represented by BATF), and NF-κB motif (represented by REL) are all significantly enriched among shared enhancers marked by H3K4me2. (D). Comparing H3K27Ac tag counts at enhancers in No Peptide as compared to 1 μM PCC treatment reveals that many enhancers see increasing H3K27Ac deposition upon stimulation. Points in red indicate greater than two-fold increase in tags upon treatment. (E) Enhancers that are more active upon stimulation, as determined by greater than two-fold H3K27Ac tags in 1 μM PCC treatment as compared to No Peptide, are enriched for pro-inflammatory transcription factor motifs. BATF, an AP-1 family member, and NF-κB are most prominent. (F) Enhancers that are more active with stimulation are enriched near activation signature genes, as can be seen with this enhancer upstream of the activation signature gene Il2ra (CD25). (G) Enhancers upstream of the activation signature gene Cd69 show an increase in H3K27Ac deposition upon treatment with 1 μM PCC. (H) Genome-wide, deposition of H3K27Ac, a marker of transcription factor activity, reflects increasing TCR signal strength at the binding sites of AP-1 family members, including BATF. At promoters, H3K4me2 marks were shared across the five conditions, but activation signature genes showed spreading of the H3K4me2 mark along the body of the gene after TCR stimulation. In contrast, H3K4me2 peaks were narrow and focal for the untreated condition at many of these genes. This effect can be seen at Cd69 (Figure 5—figure supplement 1A) and Irf4 (Figure 5—figure supplement 1B), resulting in a global increase of the ratio of gene body tags to promoter tags at activation signature genes (Figure 5—figure supplement 1C) but not genes in the bottom 10% of PC1 (Figure 5—figure supplement 1D). This implies that the process of activating these genes subsequent to TCR stimulation induces deposition of the dimethyl mark along the body of the genes as they are transcribed. We used de novo motif finding (Heinz et al., 2010) to identify lineage-determining transcription factors (LDTFs), also known as pioneer factors or master regulators, which establish cell-type-specific enhancer landscapes, and determine the available open chromatin for subsequent binding of signal-dependent transcription factors (SDTFs) (Garber et al., 2012; Heinz et al., 2013; Mullen et al., 2011; Soufi et al., 2012; Trompouki et al., 2011). The top motif was an ETS motif (Figure 5B), capable of being bound by a number of ETS factors that are expressed in CD4+ T cells, including Ets1, Ets2, and Elf1 (Anderson et al., 1999). These enhancers tend to be shared across similar cells as well as thymic T cell precursors (Heinz et al., 2010; Zhang et al., 2012). Similarly, Runx factors play an important role in T cell development (Wong et al., 2011), and correspondingly the Runx family motif was highly enriched among primed enhancers. Several known motifs for SDTFs were also enriched among the H3K4me2-marked enhancers (Figure 5C), including an Interferon Regulatory Factor (IRF) motif. Although IRFs respond to interferon signaling (Ozato et al., 2007), and would not be expected to be active in unstimulated cells (Murphy et al., 2013; Glasmacher, 2012; Li et al., 2012), it is possible that the IRF motif is a 'memory' of states of activation during the development of CD4+ T cells, and indeed IRF motifs can be found in several related cell types and multiple stages of thymocyte development (Figure 5—figure supplement 1E), suggesting that the primed enhancers in naïve CD4+ T cells are predisposed to act as binding sites for key SDTFs (Heinz et al., 2010; Zhang et al., 2012; Buecker et al., 2014; Mikkelsen et al., 2010; Mishra et al., 2014; Vahedi et al., 2012). Similarly, an AP-1 motif and an NF-κB motif were significantly enriched in primed enhancers (Figure 5C), corresponding with the fact that TCR signaling greatly increases activity of both of these transcription factors (Huang and Wange, 2004; Rincón and Flavell, 1994). Given that H3K4me2-marked regions were not substantially changed across the five conditions, we next performed ChIP-sequencing for H3K27Ac, a marker for active enhancers (Creyghton et al., 2010), under a stimulated condition (1 μM PCC) and the unstimulated condition. In contrast to H3K4me2, a substantial portion of enhancers exhibited increases in the H3K27Ac activation mark (Figure 5D, Table 2). The union set of enhancers was enriched for a similar set of motifs as the primed enhancers (Figure 5—figure supplement 1F,G). Enhancers that became more active with TCR engagement were highly enriched for both AP-1 and NF-κB motifs (Figure 5E). Further, this group of enhancers was more likely to be proximal to activation signature genes than would be expected at random (p-value = 2.0e-20 by chi-squared test). These enhancers included, for example, those upstream of Il2ra (CD25; Figure 5F) and Cd69 (Figure 5G). Pairwise overlap between the H3K27Ac peaks. Each cell contains the count of overlapping peaks where each condition shown has at least 40 tags (normalized). In the diagonal is the total number of peaks with at least 40 tags for the given condition. To investigate whether there was a quantitative relationship between TCR signal strength and enhancer activation, we performed independent ChIP-Seq for H3K27Ac in response to both peptides at low and high concentrations. Given the prevalence of the AP-1 motif in the signal-responsive enhancers, we analyzed H3K27Ac tag counts at AP-1 binding sites genome-wide using publicly available ChIP-Sequencing data from in vitro activated TH17 cells (Li et al., 2012). There was an increase in H3K27Ac deposition at AP-1 binding sites that reflected the graded strength of TCR signaling (BATF shown in Figure 4H; other AP-1 family members in Figure 5—figure supplement 1H,I), indicating that AP-1 binding sites became more active in a graded manner corresponding to increasing TCR signaling. Graded changes in H3K27Ac were much less pronounced at CTCF binding sites, which occur at enhancers but are also more broadly distributed and play roles in establishing boundary elements. We next looked at changes in super-enhancers (Hnisz et al., 2013; Lovén et al., 2013; Whyte et al., 2013) upon activation using the H3K27Ac mark. Most super-enhancers (approximately 450 out of 700 total) identified were shared by both the unstimulated and stimulated conditions. GO analysis of genes nearby the shared super-enhancers showed enrichment for leukocyte activation genes as well as Pleckstrin homology genes, which are critical components of a number of kinase signaling pathways downstream of the TCR (Figure 6A), indicating that super-enhancers in CD4+ T cells prime genes important for inflammatory signaling. These basally-primed super-enhancers included regions near key T cell genes such as Ets1 (Figure 6B), Runx1 (Figure 6—figure supplement 1A), Ctla4/Icos/CD28 (Figure 6C), and Irf4 (Figure 6—figure supplement 1B). Notably, even though many of the super-enhancers exist prior to stimulation, super-enhancers near activation signature genes show an increase in H3K27Ac signal subsequent to TCR signaling (Figure 6D). Super-enhancers prime T cell activation genes. (A) Gene Ontology (GO) analysis of genes nearest to the ~450 super-enhancers shared by treated and untreated conditions show enrichment for T cell activation genes. P-values shown are Benjamini-Hochberg adjusted p-values. (B) H3K27Ac marks a large super-enhancer around the lineage-determining transcription factor Ets1 in both the No Peptide and 1 μM PCC conditions. The super-enhancer spans the ~600 kbp region shown. (C) The ~400 kbp super-enhancer region encompassing Cd28, Ctla4, and Icos is marked by H3K27Ac in both treated and untreated conditions. (D) Despite being heavily marked by H3K27Ac in both untreated and treated conditions, shared super-enhancers near activation signature genes show a significant gain in H3K27Ac tags in response to stimulation as compared to the shared super-enhancers not proximal to activation signature genes. In other words, basally primed super-enhancers near activation signature genes see significant increases in activity upon stimulation, correlating with increased gene expression at the activation signature genes. (E) Some regions of H3K27Ac deposition required TCR stimulation to pass the super-enhancer threshold, as can be seen here at the ~60 kbp region encompassing BATF, an AP-1 family member. While H3K27Ac is clearly present under basal conditions, there is a substantial increase in enhancer activity upon treatment with 10 μM PCC. (F) Il2ra (CD25) shows increased enhancer activity and formation of a super-enhancer in the treated condition. (G) Similarly, the region surrounding Tbx21 (Tbet) shows substantial increases in activity subsequent to stimulation, resulting in the formation of a super-enhancer. (p-values based on Student’s t test; *p<0.05, **p<0.01, ***p<0.001). 118 of the 568 super-enhancers identified after TCR stimulation were not identified as super-enhancers in the unstimulated condition. The super-enhancers that required TCR signaling were enriched for leukocyte activation genes (Benjamini-Hochberg adjusted p-value = 4.6e-7) crucial for T cell activation, including Batf (Figure 6E), Il2ra (CD25, Figure 6F), Tbx21 (Tbet, Figure 6G), Lag3 (Figure 6—figure supplement 1C), and Stat5b (Figure 6—figure supplement 1D). The Ras/Raf/Mek/Erk pathway downstream of the TCR activates the AP-1 transcription factor family through a series of phosphorylation events and transcriptional induction of immediate-early genes (Murphy et al., 2013; Rincón and Flavell, 1994). Given the fact that the AP-1 motif was enriched at enhancers showing increasing activity and the fact that AP-1 binding sites saw increasing H3K27Ac deposition, we sought to determine whether AP-1 and the ERK pathway were relevant to the increasing expression of activation signature genes across the conditions. We first compared the level of phosphorylated ERK (p-ERK) in each condition using flow cytometry, and found that, like CD69 and CD25, the amount of p-ERK in the p-ERK+ cells varied on a per-cell basis in each condition, increasing with TCR signal strength (Figure 7A). Frequency of pERK+ cells also differed across peptide conditions (Figure 7—figure supplement 1A), indicating that both frequency and single-cell response level play a role in the effect of MEK inhibitors. As the increasing levels of p-ERK paralleled the general pattern of expression of the activation signature genes, we assessed binding frequencies of AP-1 factors in the gene promoters of the activation signature genes as compared to the bottom 10% of PC1 genes, and found that activation signature genes showed a significantly higher frequency of AP-1 binding (Figure 7B). This enrichment for AP-1 binding was not dependent on the expression level of the genes in each group, as segmenting the genes by RPKM showed the same pattern (Figure 7—figure supplement 2). ERK signaling translates TCR signal strength into graded gene expression. (A) ERK phosphorylation is a measure of ERK pathway activity. Flow cytometry for phospho-ERK after 3.5 hr of co-culturing shows that, on a per-cell basis, increasing signal strength yields increasing levels of phospho-ERK among CD4+ phospho-ERK+ cells. (B) ERK pathway activation is upstream of the transcription factor AP-1. ChIP-sequencing tags for four AP-1 family members (BATF, cJun, JunB, and JunD) in Th17 cells shows that there is an enrichment for AP-1 binding near the promoters (plus or minus 1,000 bp from the TSS) of activation signature genes (top 10% of PC1) as compared to all genes or the genes in the bottom 10% of PC1. (C) A MEK inhibitor that dampens signaling upstream of the ERK pathway preferentially diminishes expression of activation signature genes, as seen in the fact that the RPKM of genes in the top 10% of PC1 is significantly reduced with treatment. (D) The reduction of RPKM seen with the activation signature genes is not a general effect, as the RPKM of the genes in the bottom 10% of PC1 are not significantly affected by MEK inhibitor treatment. (E) We quantified the effect of MEK inhibitor treatment using the activation signature score. Treatment with the MEK inhibitor reduces the activation signature score for all samples. (F) Schematic of the ERK-AP-1 axis. See text for details. (p-values based on Student’s t test; *p<0.05, **p<0.01, ***p<0.001). ERK pathway activation and AP-1 binding therefore seemed to correlate well with the graded profile of activation signature genes and the increasing activation score across the samples. In order to determine whether the gradual increase in ERK pathway activation was causal in translating TCR signaling into gradual increases in the expression of activation signature genes, we pretreated the CD4+ T cells with a low-dose MEK inhibitor (MEKi). MEK inhibition upstream of ERK was capable of suppressing p-ERK activity entirely, and titration of MEKi yielded intermediate levels of p-ERK on a per-cell basis (Figure 7—figure supplement 1B). Low-dose MEK inhibition decreased the levels of the extracellular signaling marker CD69 (Figure 7—figure supplement 1C), which was in the top 10% of PC1, but this suppression was not universal, as CD4, an example of a gene not in the top 10% of PC1, was not significantly affected (Figure 7—figure supplement 1D). In order to see if this preferential suppression of activation signature genes was widespread, we performed RNA-seq on the five conditions after pretreatment with MEKi at IC50 (0.5 μM). If TCR signaling strength upstream of pERK yields graded levels of ERK that are in turn essential for the graded levels of activation response genes, then reduction of pERK levels should move each sample downwards in activation score, such that the high-dose, high-affinity case looks like the low-dose, high-affinity; the low-dose, high-affinity looks like the high-dose, low-affinity; and so on. Accordingly, MEK inhibition at IC50 decreased expression of activation signature genes (Figure 7C, Figure 7—figure supplement 1E), but, as with extracellular expression of CD69, this effect was selective; expression of genes in the bottom 10% was increased or unchanged (Figure 7D, Figure 7—figure supplement 1F). The decrease in expression among genes in the top 10% of PC1 upon MEKi treatment was not dependent on expression level of the genes, as the effect was consistent when genes were segmented by RPKM level (Figure 7—figure supplement 3). Using the activation score to assess total T cell activation status, we found that MEKi shifted each sample down in score (Figure 7E), as would be expected if the graded levels of pERK seen with each condition were prescriptive of the activation status of the condition. Thus, graded levels of pERK downstream of the TCR help to translate the analog activation signal to graded levels of enhancer activity and gene expression genome-wide (Figure 7F). Understanding how CD4+ T cells respond to ligands of different doses and affinities is critical to understanding the nature of the adaptive immune response to both pathogens and self. Here, we have shown that the traditional model of a purely digital TCR response is too simple; on a per-cell basis, stronger TCR signals result in higher levels of phosphorylated ERK, a proportional increase in enhancer acetylation, and quantitative increases in activation markers such as CD69 and CD25 (Figure 7F). As a result of both these single-cell differences and the increasing frequency of respondent cells, varying the dose or the affinity of the pMHC-TCR interaction results in a gene expression profile that is graded corresponding to increasing strength of TCR signaling. We observed no evidence for Th1/Th2 skewing as a function of peptide dose/affinity, which may reflect the specific peptides used for stimulation. Notably, the predominance of PC1 and the graded gene expression patterns together indicate that dose and affinity are not interpreted separately downstream of the TCR, but rather overall signaling strength sets the level of activation across the population. A similar conclusion has been drawn by looking at the sum of activation parameters induced by antigen-, co-stimulatory- and cytokine-receptors (Marchingo, 2014). Prior analysis of T cell responses at the single cell level showed that single T cell engagement of different numbers of identical peptide agonists (titration of signal strength) resulted in digital responses read out as increasing numbers of T cells producing the same amount of TNF or IL2 protein (Huang et al., 2013). Intriguingly, different levels of responses were seen when naïve cells were compared with blast and memory cell responses, such that the rate of TNF and IL2 synthesis in blasts and memory cells was nearly ten-fold higher than in naïve cells. Our findings are consistent with these earlier studies in that TNF and IL2 are members of the ‘digital’ class of RNAs identified in CD69+ cells (Figure 3—figure supplement 1E). Furthermore, the increase in expression of genes involved in protein expression revealed by the present studies could at least partly explain the observation that the rates of TNF and IL2 protein production are increased in blasts and memory cells in comparison to naïve cells. The analogue increase in protein biosynthetic machinery could also at least partly explain the observation that CD69 expression is digital at the level of mRNA but analogue at the level of protein expression (Figure 1A, Figure 3—figure supplement 1F). Ranking genes along a primary axis of variation allowed us to extract a set of activation signature genes that increase in a graded fashion at the population level proportionally to TCR signal strength, and further to establish an activation score that can rank arbitrary CD4+ T cell samples by the strength of signaling. The data presented here therefore gives us a greater understanding of the CD4+ T cell response to ligands of varying concentrations and affinities, and informs our understanding of CD4+ T cell activation under diverse conditions. Significant differences in primed enhancers have been demonstrated under several stimulating conditions in macrophages, and demonstrate the ability of cells to quickly remodel chromatin to initiate particular gene expression programs (Kaikkonen et al., 2013; Ostuni et al., 2013). Surprisingly, we did not find significant changes in the primed enhancer landscape upon TCR activation in CD4+ T cells. Similarly, even the more labile activation mark H3K27Ac was largely similar across conditions, with many activation genes marked as super-enhancers even before stimulation. 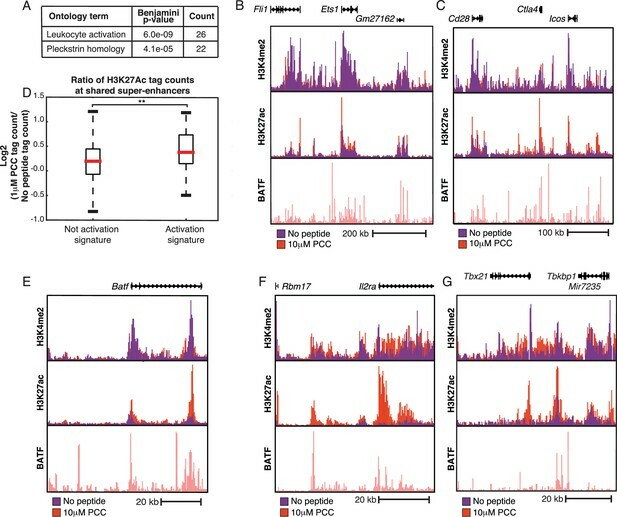 While it remains to be seen whether non-TCR signaling pathways or polarizing conditions induce more dramatic changes, the data presented here indicates that the CD4+ T cell enhancer landscape is largely pre-established, with subsets of H3K4me2-marked enhancers increasing in activity, but little in the way of de novo enhancer establishment. This finding helps to explain the speed and plasticity of the CD4+ T cell response (Zhou et al., 2009)—if all enhancers are primed basally, and many are even activated basally, then pro-inflammatory transcription factors can bind at established enhancers and initiate new gene expression programs with minimal additional transcriptional machinery. Both the frequency of AP-1 binding and the level of pERK correlate with the strength of TCR signaling and the graded expression of activation signature genes. At least one of the feedback loops leading to digital TCR signaling, the son of sevenless (SOS) positive feedback loop, exists upstream of ERK, and it has been shown in thymocytes that pERK signaling is digital (Das et al., 2009; Daniels et al., 2006; Prasad et al., 2009). However, studies focused on EGFR signaling upstream of ERK indicated that discrete pulses of ERK activity result in quantitative levels of downstream signaling activity (Albeck et al., 2013). Our analog results for pERK can be interpreted to support the notion that TCR signaling in thymocytes functions differently than TCR signaling in mature T cells. Notably, both Themis and SOS, two key components of digital signaling in thymocytes, do not seem to be critical to mature T cell signaling (Fu et al., 2013; Warnecke et al., 2012). The graded levels of pERK in CD4+ T cells prove important for downstream enhancer and gene activity. We have here established a mechanistic link between the level of ERK signaling and the expression patterns of activation signature genes by using an inhibitor of MEK, upstream of ERK. Low-dose MEK inhibition selectively decreased expression of the activation signature genes such that the activation score under the inhibited conditions was incrementally decreased. This indicates that the analog levels of pERK seen on a per-cell basis are translated at a population level into increased enhancer and gene activity, and that 'turning down' pERK levels selectively diminishes the activation status of the cells. This finding is of particular interest in light of the clinical availability of numerous RAF, MEK, and ERK inhibitors (Zhao and Adjei, 2014; Samatar and Poulikakos, 2014). Our findings suggest that low-dose ERK pathway inhibition could be used to selectively decrease the activity of activation signature genes in CD4+ T cells, achieving low-level immunosuppression without killing T cells or completely removing their ability to respond to TCR signaling. Further, the effect of MEK inhibitors on CD4+ T cells raises questions about the immunosuppressive effects of using MEK inhibitors in cancer treatment, especially as current clinical trials combine MEK inhibitors with checkpoint-blockade inhibitors (Zhao and Adjei, 2014; Vella et al., 2014). Notably, NFκB is one of many transcription factors known to play important roles in T cell biology, and indeed we find a κB motif enriched among enhancers that are responsive to stimulation (Figure 5E). Further research as to the relationship between the strength of TCR signaling and other signal-dependent transcription factors such as NF-κB and NFAT is warranted. 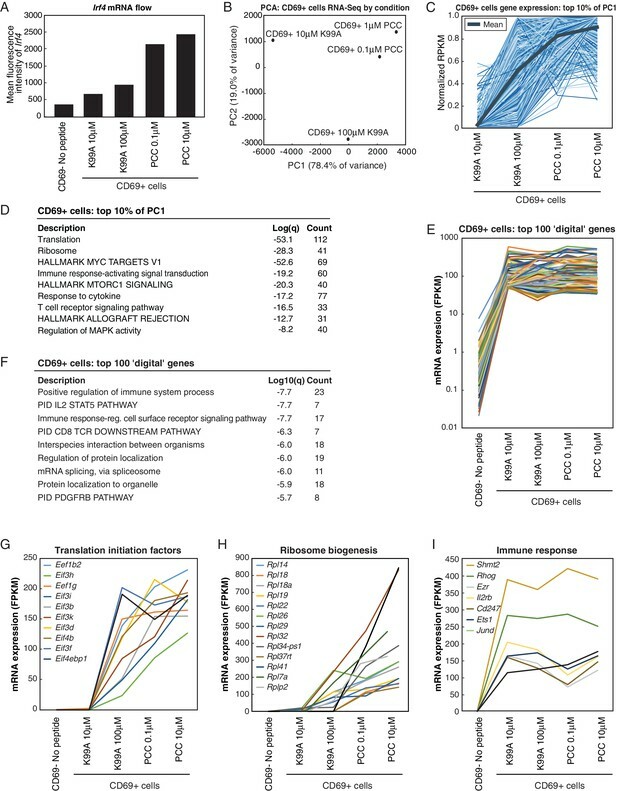 In sum, this study makes use of a unique model system to dissect the transcriptional responses of CD4+ T cells to increasing strength of signaling, and demonstrates that analog levels of pERK within the context of digital TCR signaling flow downstream to result in graded gene expression profiles and enhancer landscapes that can be used to characterize CD4+ T cell signaling at large. AND mice on a B10.BR background were received from Dr. Michael Croft (Rogers and Peptide dose, 1999; Rogers et al., 1998) and bred in a specific pathogen free facility. All animal experiments were in compliance with the ethical standards set forth by UC San Diego’s Institutional Annual Care and Use Committee (IUCAC). Spleens were extracted and manually digested. CD11c+ cells were isolated using Miltenyi Biotec Inc. (San Diego, CA) MACS magnetic cell separation with positive selection for CD11c (CD11c, Biolegend, cat. no. 117304). Subsequently, the CD11c- splenic fraction was used to negatively select for naïve CD4+ T cells using the Miltenyi MACS system with the following antibodies: CD11c (Biolegend, cat. no. 117304); CD45R (eBioscience, cat. no. 13-0452-86); CD11b (eBioscience, cat. no. 13-0112-86); CD25 (eBioscience, cat. no. 36-0251-85); CD49b (eBioscience, cat. no. 13-5971-85); CD69 (eBioscience, cat. no. 13-0691-85); CD8a (eBioscience, cat. no. 13-0081-86); Ly-6G (eBioscience, cat. no. 13-5931-86); MHC class II (eBioscience, cat. no. 13-5321-85); TER-119 (eBioscience, cat. no. 13-5921-85). CD11c+ and CD4+ cells were cultured at a ratio of 1:2 in 96-well round-bottom plates for 24 hr, 108 hr (for proliferation assay), or 3.5 hr (for ERK phosphorylation staining). Peptides were added at indicated concentrations with the CD11c+ and CD4+ cells in DMEM supplemented with 10% Fetal Bovine Serum. For sequencing experiments, CD4+ cells were re-isolated from the culture using the Miltenyi MACS system and the same set of antibodies as above less CD25 and CD69. For phospho-ERK staining, whole splenic cells were used, rather than purified CD11c+ and CD4+ cells. Lyophilized peptides were resuspended in water, and added at the indicated concentrations to the cell cultures. Unstimulated CD4+ cells received an equivalent amount of water alone. Flow cytometry was performed on a LSR II and LSR Fortessa, both from BD Biosciences (San Jose, CA). Cells were stained as per manufacturers’ protocols with the following antibodies: CD4-APC (eBioscience, cat. no. 17-0042-83); CD4-PE-Cyanine7 (BioLegend, cat. no. 116016); CD69-FITC (eBioscience, cat. no. 11-0691-82); CD25-PE (eBioscience, cat. no. 12-0251-82); Valpha11-FITC (BD Pharmingen, cat. no. 553222); Vbeta3-PE (BD Pharmingen, cat. no. 553209); CD11c-PE-Cyanine7 (eBioscience, cat. no. 25-0114-82); IRF4-PerCP-Cy5 (eBioscience, cat. no. 46-9858-80); Tbet-PE (Santa Cruz Biotechnology, cat. no. SC-21749); CD122-PE (BioLegend, cat. no. 105905); Ly6a-APC-Cyanine7 (BioLegend, cat. no. 108125); CD200-APC (BioLegend, cat. no. 123809); TNFSF11-APC (BD Biosciences, cat. no. 560296); phospho-ERK-Alexa Fluor 488 (Cell Signaling, cat. no. 4344S). Live/dead staining was performed using Fixable Aqua (Life Technologies, cat. no. L34957; or Biolegend, cat. no. 423102). Cells were gated on CD4+, Aqua- cells. For phosphor-ERK staining, permeabilization was performed using BD Phosflow Perm Buffer III (cat. no. 558050) and BD Fix Buffer I (cat. no. 557870). Analysis was performed with FlowJo v10.6 (Tree Star; Ashland, OR). All flow cytometry results shown are representative of at least two biological replicates, and the results shown in Figure 1 were reflected with samples held out of each high-throughput sequencing assay. CD11c+ cells and naïve CD4+T cells were isolated form spleens of AND mice using magnetic separation as described above. CD11c+ cells and CD4+ T cells were cultured at a ratio of 1:2 in 96 –well round bottom plates with various concentrations of K99A (10 μM and 100 μM) and PCC (0.1 μM and 10 μM). After 22 hr, cells were harvested and mRNA expression of Irf4 was analyzed on single cell level by flow cytometry in combination with CD4, and CD69 protein staining, using FlowRNA II Assay kit (Affymetrix eBioscience) according to manufacturer’s protocols (Porichis et al., 2014). Cells were analyzed with a BD AriaII flow cytometer. Data were analyzed using FlowJo v887software (Tree Star). Two technical and two biological replicates were obtained across all conditions using the two different peptides at two different concentrations to stimulate naïve CD4+ T cells. Prior to sequencing, CD4+ T cells were separated from the co-cultured cells using Miltenyi MACS negative selection as described above for the initial culturing. ChIP-sequencing for H3K4me2 and H3K27Ac in the 1 μM peptide treatments was performed as described (Gilfillan et al., 2012), with the following modifications: sodium butyrate was used to inhibit de-acetylation; and three RIPA and three LiCl washes were performed instead of five and one. ChIP-sequencing for H3K4me2 and H3K27Ac across the five conditions was performed as described (Gosselin et al., 2014). RNA-sequencing was performed as described, with minor modifications (Wang et al., 2011). Two replicates of the H3K4me2 ChIP-seq across all five conditions were obtained; three replicates across three conditions and one across all five conditions were obtained for the H3K27Ac ChIP-seq; and two replicates across all five conditions of the RNA-seq were obtained. ChIP-sequencing antibodies used were: H3K4me2 (Millipore, cat. no. 07–030) and H3K27Ac (Abcam, cat. no. ab4729 and Active Motif, cat. no. 39135). To analyze the transcriptome of activated CD4+ T cells, we sorted CD69 positive cells. CD11c+ and CD4+ T cells were cultured for 22 hr as described above using two peptides at different concentrations K99A (10 μM and 100 μM) and PCC (0.1 μM and 10 μM). After harvesting, cells were stained with Zombie Aqua live/dead stain (Biolegend) and with CD4-PE (clone RM4-5, eBioscience) and CD69-PE Cy7 (clone H1.2F3, eBioscience) conjugated antibodies. Cells were sorted with a BD AriaII cell sorter using a 70 μm nozzle. Live CD4+ cells were sorted into two populations according to the expression of the CD69 activation marker. CD69+ cells from the various culture conditions were used for RNA extraction. Unstimulated CD69- cells were used as controls. After extraction with Trizol, RNA was PolyA-selected (MicroPoly(A) Purist kit, Ambion) and libraries were generated as previously described (Heinz et al., 2013). Samples were sequenced using NextSeq2 (Illumina) according to manufacturer recommended protocols. CD4+ T cells, isolated as described above, were pre-treated with 0.5 μM Promega U0126 (cat. no. V1121) for thirty minutes at 37°C. CD11c+ cells and peptides were subsequently as indicated and cultured in the presence of the inhibitor for 24 hr. ChIP-sequencing reads were mapped to the mm10 genome using Bowtie2 (Langmead and Salzberg, 2012), and RNA-sequencing reads were mapped using STAR (Dobin et al., 2013). Default allowed error rates were used, and only uniquely mapping reads were used in downstream analysis. Initial processing of aligned data and peak calling was performed using Homer (Heinz et al., 2010). IDR analysis (Landt et al., 2012) for ChIP-sequencing replicates was performed using the homer-idr package (Allison, 2015). Vespucci (Allison et al., 2014) was used for counting AP-1 tags in gene regions. Gene Ontology analysis was performed using the Metascape Gene Annotation and Analysis Resource tool (http://metascape.org/gp/index.html#/main/step1) using the express analysis settings (Tripathi et al., 2015). Super-enhancers were called using Homer (Heinz et al., 2010), which follows the published procedure (Hnisz et al., 2013; Lovén et al., 2013; Whyte et al., 2013) by first stitching together peaks into larger regions and then sorting regions by normalized H3K27Ac tag count. Region scores are plotted against rank, and a threshold is defined by finding the point at which the tangent to the plotted rank-scores is one. Regions past that threshold are called super-enhancers. Underlying data sets, including RPKM values and peaks, as well as code for all analyses described is publicly available at https://github.com/karmel/and-tcr-affinity. Analyses were performed using iPython Notebook (Perez and IPython, 2007). Clustering and PCA was performed using the scikit-learn package (Pedregosa, 2011). For full execution details and parameters, please see the code in the Github repository linked here. To generate the list of genes used in the activation signature score, we separately ran Principal Component Analysis on two replicates of RNA-Seq data and also the combined expression data from both replicates. Genes with an RPKM less than 100 in the No Peptide condition or a standard deviation greater than 20% of the No Peptide expression level across replicates were then omitted from the target set of genes. Remaining genes were sorted along PC1, and genes that were in the top ten percent in all three data sets (215) or the bottom ten percent in all three data sets (137) were included in the set of activation signature score genes used in analysis. To compute the activation signature score, we take the dot product of the values of genes along PC1 in the combined RNA-Seq data set and the mean-centered expression levels for those genes for each sample in an experimental data set, yielding a single scalar score for each experiment. The scores across samples are then scaled by the max score, ensuring values are in the range of [-1, 1]. The activation signature score tool is described and downloadable here: https://github.com/karmel/and-tcr-affinity/tree/master/andtcr/rna/activationscore. Publicly available datasets used for the analyses in Figure 3 and Figure 3—figure supplement 3 is available from GEO with the following Accession Codes: GSE14308, GSE32224, GSE41866, GSE42276, GSE54938, and GSE60337. AP-1 binding data is from GSE39756. For Figure 5E, the following datasets were used: GSE56456, GSE31233, GSE40463, GSE21365, GSE56098, GSE21512. Raw and processed data are provided in the Gene Expression Omnibus (GEO) under accession number GSE69545. Proceedings of the National Academy of Sciences of the United States of America 111:E3679–E3688. International Reviews of Immunology 23:347–363. Proceedings of the National Academy of Sciences of the United States of America 110:11833–11838. Cold Spring Harbor Perspectives in Biology 2:a005538. The Journal of Experimental Medicine 155:1086–1099. The Journal of Biological Chemistry 279:28827–28830. European Journal of Immunology 1:1–9. The Journal of Experimental Medicine 190:1627–1636. The Journal of Immunology 185:4520–4524. The Journal of Immunology 193:4485–4496. Trends in Biochemical Sciences 31:268–275. The Journal of Immunology 192:5881–5893. The Journal of Biological Chemistry 282:20065–20069. Proceedings of the National Academy of Sciences of the United States of America 106:528–533. Nature Reviews. Drug Discovery 13:928–942. The Journal of Immunology 172:5828–5832. The Journal of Experimental Medicine 150:830–848. Cellular & Molecular Immunology 11:305–313. Keystone Symposium on Advances in the Knowledge and Treatment of Autoimmunity. pp. 4–9. Proceedings of the National Academy of Sciences of the United States of America 110:1023–1028. Nature Reviews. Clinical Oncology 11:385–400. Current Opinion in Immunology 33:43–48. Thank you for submitting your work entitled "Affinity and Dose of TCR Engagement Yield Proportional Enhancer and Gene Activity in CD4+ T Cells" for peer review at eLife. Your submission has been favorably evaluated by Tadatsugu Taniguchi (Senior editor), a Reviewing editor, and three reviewers. Your paper has been seen by a Reviewing Editor and three expert referees. While all believe that the topic is of importance and that the data sets you have generated are of substantial value to the field, there are major concerns about the core conclusions of your study that prevent the paper from being accepted in its present form. Because all the reviews contain important comments and specific requests for new studies, in two cases to clarify the central issue of how T cells respond to various strengths of stimulation (variation per cell in response or variation in the fraction of responding cells) and in another to strengthen the genomic/epigenetic analyses, we have included these reviews verbatim rather than in the usual eLife integrated format. If new experiments and data can be generated to address these issues and a revised paper submitted within the 2 month-window permitted by eLife policy, it will be reviewed as a revised submission. If the new work and resubmission takes longer, the paper will be considered a new paper, but we will endeavor to have the same individuals examine the new manuscript to provide consistency in the evaluation process. It may be helpful to address a letter to the Senior Editor addressing what you believe you can achieve in a reasonable length of time to address the criticisms raised by the reviewers. In this manuscript the authors use a well-studied model system in which primary mouse CD4+ T cells expressing the transgenic AND TCR are stimulated with antigen presenting cells presenting pigeon cytochrome c (PCC) or variant peptides with a range of affinities for the TCR. While several aspects of T cell activation have been described as digital or analog, the authors contend that this dichotomy is too simple. They show at a single time point that the MFI of CD69 and CD25 of responding cells correlated with the relative strengths of TCR stimulation. To determine how titration of ligand affinity affected the transcriptional responses, the authors used RNA-seq and principal component analysis to identify a subset of "activation signature genes" which responded in a graded manner to peptide affinity and dose. ChIP-seq was used to compare the extent of epigenetic tagging of enhancers and showed that the degree of H3K4me2 tagging of activation signature genes increased in a graded manner in response to changes in TCR stimulation strength. Motif analysis also revealed that enhancers that became more active with TCR signal strength were enriched for AP-1 and NFkB sites. To determine how this subset of activation signature genes responded to perturbation of the Ras/Raf/Mek/Erk pathway, the authors performed ChIP-seq analysis on T cells stimulated with partial Mek inhibition. Consistent with the top 10% of PC1 genes having a bias toward genes containing AP-1 sites, the activation signature genes were appreciably more susceptible to Mek inhibition than the bottom 10%. The authors conclude that the ERK pathway is responsible for translating varying strengths of TCR stimuli into similarly graded enhancer activity. In this article the authors raise an important question. However, the conclusions drawn in this study, while plausible, lack sufficient supporting experimental evidence. 1) The major design flaw of the RNA-seq and ChIP-seq experiments is that the source RNA or DNA analyzed was pooled from an entire population of stimulated cells (including for example both CD69- and CD69+ cells). As a result, it is not possible to determine whether the graded gene expression/epigenetic changes occur due to graded responses homogenously in every cell, or due to decreasing frequencies of responding cells as the affinity of stimulating peptide is decreased. In Figure 1 the authors demonstrate this heterogeneity at a single cell level that decreasing the potency of TCR stimulus decreases the frequency of cells that express CD69 and CD25. This is not to say that there may be graded responses amongst the responding cells. 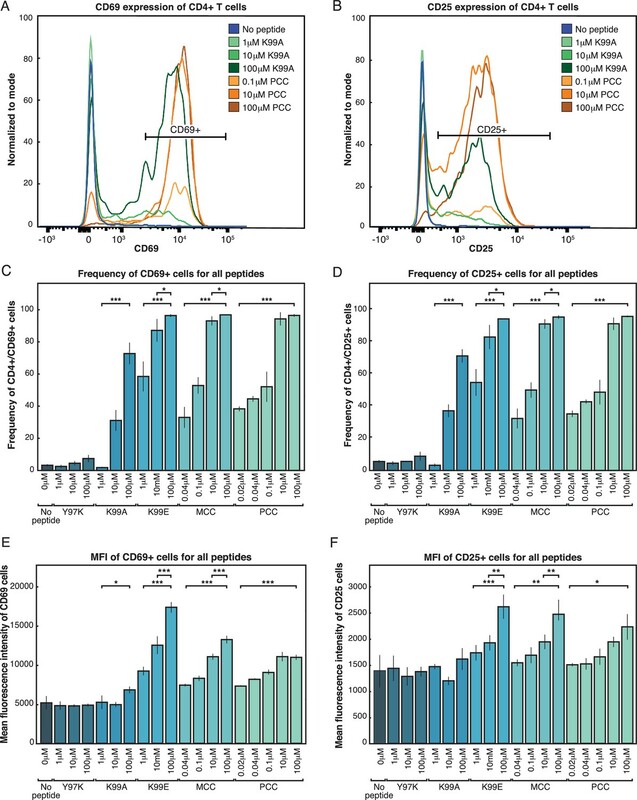 The data generated by flow cytometry in Figure 1 and Figure 6A demonstrate that the MFI of CD25, CD69 and phospho-ERK can be dose dependent, when gated on the responding cells. One should note, however, that they only do their flow analysis at a single time point and it is not clear that maximal responses have been reached at lower doses of peptides or with weaker peptides. Regardless, however, RNA-seq and ChIP-seq analyses on bulk populations cannot formally discriminate whether the signals detected come from each cell equally or from a subpopulation of cells. A more informative experiment would involve sorting the CD69+ cells after stimulation with varying concentrations/affinities of peptide, and then performing RNA-seq or ChIP-seq. 2) The Abstract and the Discussion imply that ERK activation is the predominant pathway that accounts for inducing graded enhancer activity. However, this ignores other known pathways that are likely to contribute to activation signature gene transcription, such as NFAT and NFkB. Indeed, NFkB sites appeared to be enriched in the activation signature genes as well (Figure 4E). Understanding how T lymphocytes respond to antigens of varied doses or quantities remains a critical issue in immunology. Indeed, much biochemical effort has been focused on the first minutes of T cell activation (e.g. biophysics of TCR/pMHC interaction, or dynamics of signaling response or synapse formation). In these settings, T cell activation (as measured by NFAT translocation or ERK phosphorylation among others) was found to be essentially digital, with the frequency of cells getting activated increasing with increasing doses or increasing quality of antigens. On the other hand, the typical degree of activation (amongst activated cells, as measured by the mode of ppERK or NFAT activation) was found to be essentially constant on short timescale (e.g. t<30min), although recent work in the EGFR pathway argued for frequency encoding of activation strength (Albeck et al., 2013). T cell activation and regulation of immune responses occur over longer timescales (> hr): this opens up opportunities for T cells to register, in an analog manner, quantity and quality of antigens, while short-term responses were essentially digital. In this article, Allison et al. report that early cellular markers of T cell activation (e.g. CD25 and CD69 upregulation) are indeed bimodal yet, the mode of protein abundances amongst activated T cells tracks the strength of antigen stimuli (quality and quantity). Subsequent analysis tracks alterations in the landscape of epigenetic marks to demonstrate their correlation with the strength of antigenic stimulation. One key issue in this study is that changes in the amplitude of response amongst activated cells (analog mode) occur concomitantly with changes in the frequency of cells getting activated (digital mode), for different antigen strength (cf Figure 1). The authors argue that the dominant mode of regulation is the amplitude of signaling amongst activated cells. This conclusion is supported qualitatively by the application of MEK inhibitors (Figure 6), although the authors fail to report that the impact of MEK inhibition is solely on the mode of ERK phosphorylation and not on the frequency of T cell activation. Yet, most outputs are measured in bulk (e.g. by sequencing of a population of sorted cells) except for Tbet and Irf4 (Figure 2). Thus changes in gene regulation may be dominated by the changes in frequency of activated cells rather than by changes in the modes of activated cells. Overall, a direct quantitative test of this observation is not carried out: changes in frequency of activated T cells and mode of gene upregulation are confounding consequences of antigenic activation that must be better deconvolved at the individual cell level. The paper also makes a strong case about the ability of T cells to register the strength of antigenic stimuli in terms of gene regulation. Using publicly available data and new datasets acquired in-house, the authors derive a gene signature that encompasses the dominant mode of variation of gene up/down regulation in T lymphocytes. Surprisingly, a single score derived from a simple principal component analysis is shown to encompass almost completely the variability of T cell gene regulation (at homeostasis or under activation). Moreover, this PCA score is shown to report back the strength of activation in different settings (with/without costimulation, with/without involvement of Trim28 etc. ): this result is striking as it implies that T cell activation can be quantified as the sum of input signal -a similar result was recently reported by the Hodgkin group (Marchingo et al., 2014). The results and analysis presented here by Allison et al. in terms of gene regulation is very exhaustive and adds to our quantitative understanding of T cell activation. Allison et al. also report that constitutive levels of activation amongst CD4+ T cells (isolated from different mouse strains) vary dramatically and a hierarchy among them can be established based on the universal PCA score derived from T cell activation. This is an interesting observation that would require further investigation: does it imply stronger or weaker responsiveness to antigen stimulation? This issue of potential tuning to constitutive TCR stimulation is long standing (Mandl et al., 2013), and possibly beyond the scope of this study. Still, a more quantitative analysis is warranted to test the strength of this quantitative correlation e.g. using partial least square regression to identify the latent variables (antigen quantity and quality, frequency of response, mode of response) that best account for the measured variability in gene output (Kemp et al., 2007). Overall, this study reports interesting observations related to quantitative aspects of T cell activation in terms of global gene regulation. Additional effort to rigorously quantify the impact of antigen strength would help deconvolve how frequency and mode of activation impact overall gene regulation at the individual cell level. Albeck, J.G., Mills, G.B., and Brugge, J.S. (2013). Frequency-modulated pulses of ERK activity transmit quantitative proliferation signals. Molecular cell 49, 249-261. Kemp, M.L., Wille, L., Lewis, C.L., Nicholson, L.B., and Lauffenburger, D.A. (2007). Quantitative network signal combinations downstream of TCR activation can predict IL-2 production response. Journal of immunology 178, 4984-4992. Mandl, J.N., Monteiro, J.P., Vrisekoop, N., and Germain, R.N. (2013). T cell-positive selection uses self-ligand binding strength to optimize repertoire recognition of foreign antigens. Immunity 38, 263-274. Marchingo, J.M., Kan, A., Sutherland, R.M., Duffy, K.R., Wellard, C.J., Belz, G.T., Lew, A.M., Dowling, M.R., Heinzel, S., and Hodgkin, P.D. (2014). T cell signaling. Antigen affinity, costimulation, and cytokine inputs sum linearly to amplify T cell expansion. Science 346, 1123-1127. Better statistical tests to deconvolve frequency and mode of activation and their impact on gene regulation are warranted. In this study, Allison et al. characterize gene expression and histone modifications in CD4+ T-cells subjected to varying levels TCR engagement. 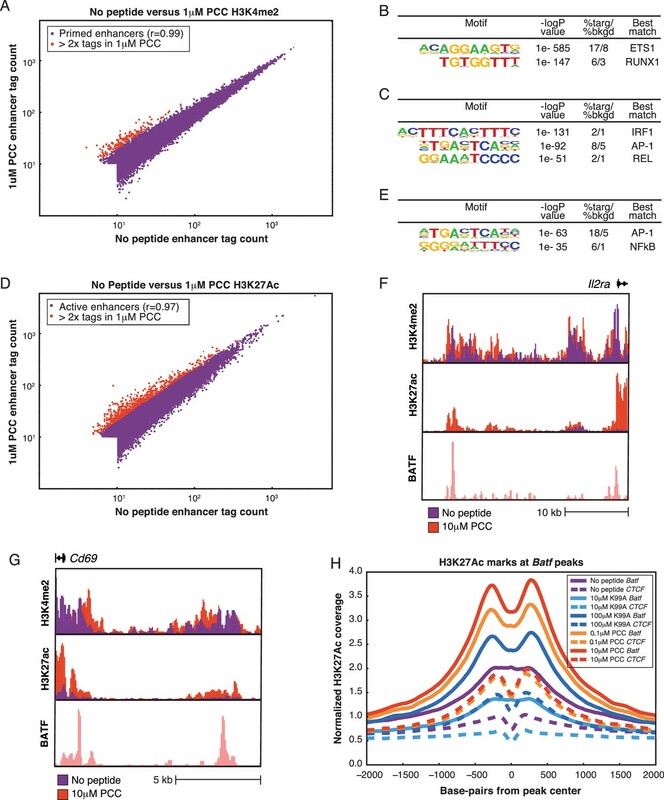 The authors use PCA to identify an "activation gene signature" and define an "activation score", concordant with traditional measures of T-cell activation level, and use their enrichment score to re-analyze existing data sets. They also use this approach to analyze the consequence of TCR activation in different mouse strains. They find antigen concentration-dependent variation in histone modification (H3K27ac, H3K4me2) near activation signature genes. Finally, the authors find that MEK inhibition specifically reduces the expression of activation genes. The authors conclude that whereas TCR engagement can be viewed as a digital signal, the ERK pathway translates TCR activation to graded gene activation. The manuscript reports one of the first genome-wide studies of transcriptional regulation in response to varying levels of stimulation coupled with associated epigenetic changes. As such, this will be of interest to both the T-lymphocyte and broader transcriptional regulation communities, and will also be a useful resource for future investigation. However, there are a number of issues that should be resolved. For many of the authors’ observations, the authors should present a control where expression levels (or fold-change upon stimulation) are considered. For example, when comparing properties of the top 10% vs bottom 10% of PC1 genes (e.g., histone modification levels, super-enhancer levels, or the effect of MEK inhibition), an alternative to the authors' conclusion that activation signature genes are functionally distinct from non-activation genes is that these features are simply proportional to expression level. Another example of this potential confounding effect is the AP-1 motif frequency in the top-10% vs. bottom-10% of PC1 genes – this might reflect expression level. To account for differences in expression level, the authors could sample from the set of top and bottom activation genes such that their distributions of expression levels match, and then compare the genomic features between these expression-controlled samples. Some of the reported effects arise from differences in expression level and that some of the authors' observations recapitulate well-established relationships between histone modification levels and expression levels. In principle, the activation score could be a useful tool; however, what is the evidence that the activation score is a more accurate measure than expression levels of individual well-established activation markers (e.g. CD69, CD25, etc.)? In what way is it superior to these other markers? Why is a T-cell-specific ontology term not found in the "activation gene signature"? What are the terms enriched in the bottom 10% of activation signature genes? The details of the ontology search should be clarified: did the authors compare annotations of the top-10% to those of the bottom-10% genes? or top-10% genes vs. all genes – in which case there will of course be a bias towards T-cell function because they imposed a minimum expression threshold (10 RPKM) before performing PCA to select signature genes. The authors should also provide sufficient details about the specific random model used whenever they describe a p-value to assess the significance of an observation. It is well-appreciated in the T cell activation literature that peptide concentration influences Th1/Th2 skewing (e.g. Rogers and Croft, 1999). It is curious that the authors did not choose to examine this outcome. Were "Th2" genes preferentially enriched with low-dose, low-affinity peptides? Likewise, some mouse strains are more Th2-ish than others. Was this evident in the transcriptomes? The strategy to isolate naïve T cells is problematic. It's not a problem generally since TCR transgenic mice are used. However, it probably is a problem for the experiment shown in Figure 3E. This experiment may very well reflect contaminating memory cells. Presumably, these represent cells directly analyzed following isolation. The authors should show their isolation technique results in a truly naïve population of cells. It is not clear from the Methods how many replicates were obtained in RNA-seq and ChIP-seq experiments. In general, the figure legends and Methods should more clearly state the replicates and independent experiments performed. The histone ChIP-seq experiments refer to "across the five conditions". Presumably this refers to unstimulated cells and the two concentrations of the two peptides. However, the preceding figure includes lots of conditions; this will be confusing for readers. There is no presentation of global data depicting responses to both peptides and doses. More information on numbers of peaks, quality control and overlap (Venn diagrams etc.) would be of interest. Readers may find Figure 4E confusing. The text refers to AP1 motifs and the figure depicts BATF. BATF, of course, is a member of the AP1 family; however, not all readers may immediately understand this. The figure legend is clear, but the text may still be confusing. The text also tacitly equates AP1 and Batf, but this is obviously not the case. Fos/Jun are players in TCR signaling. It is understandable that the authors have used existing Batf ChIP-seq data, but other AP1 family members undoubtedly contribute to activation. Figure 4H is also confusing. Readers may not understand right away that the legend indicates solid and dashed lines. It is an important piece of data, so the authors should make it easier for readers to get this right away. The choice of colors is also confusing (purple refers to Batf and CTCF). This figure is more complicated than it needs to be. Is 0.1 μm PCC used? Is 1 μm PCC not used in Figure A? The authors should check all the figures for labeling errors, e.g. : Figure 1A,B: green 100 μm curve is labeled PCC instead of K99A. Figure 1E: x-axis labels are missing decimal points. The choice of CTCF is also of interest, insofar as one would not necessarily expect that it would be a TF that would be responsive to graded signals. In Figure 2F it would be desirable to show both MFI and% positive cells. Given the effect of peptide concentration on Th1/Th2 skewing, showing GATA3 as well might be illuminating. Figure 5 – more explanation of Pleckstrin homology genes and the potential relevance to T cell activation is warranted. Thank you for resubmitting your work entitled "Affinity and Dose of TCR Engagement Yield Proportional Enhancer and Gene Activity in CD4+ T Cells" for further consideration at eLife. Your revised article has been favorably evaluated by Tadatsugu Taniguchi (Senior editor), a Reviewing editor, and three reviewers. Two of the reviewers felt that some primary data were needed to help the readers evaluate important new studies now included in the revised manuscript. There were also some important discussion issues that should be addressed. In the original manuscript by Allison et al., a major experimental design flaw pointed out by two reviewers was that the source material for the RNA-Seq and ChIP-seq data studies was from a mixed population of responding (CD69+) and non-responding (CD69-) T cells, rather than a purified population of responding (CD69+) cells. In the revised manuscript, the authors have added new experimental data that address this major concern. Figure 3A shows graded expression of a single example, Irf4 transcripts, amongst the CD69+ cells that respond to APC/peptides of varying affinity, and the rest of Figure 3 shows RNA-Seq data from the CD69+ cells sorted from a bulk population of activated T cells. The results of both approaches are consistent with the authors' conclusions that there can be graded transcriptional signatures on a per-cell basis. Whereas the RNA-Seq data largely satisfy this concern, there is still some uncertainty about the results presented by the RNA-flow in Figure 3A. The authors should include data in the figure for some "loading control" type controls, or alternatively, other examples. Specifically, the concern is whether most or all transcripts exhibit a similar pattern (graded, and increases with increased peptide affinity) using this technique, which is relatively new and not yet widely used in the field. 1) The authors should discuss the work in Huang et al., 2013 a bit more in which the Davis lab showed that single T cell engagement of different numbers of identical peptide agonists (titration of signal strength) resulted in digital responses read out as increasing numbers of T cells producing the same amount of cytokine. Different levels of responses were seen when naïve cells were compared with blast cell responses – at the single cell level. Second, the authors seem not to have considered different temporal responses. Analysis at a single time point eliminates the potential for the cumulative effects of weak signaling, particularly if there is asynchrony in the population. Strong signals tend to be more synchronous. This resubmission includes an additional set of experiments that goes a long way towards addressing the previous reviews. The authors use RNAseq on activated/sorted T cells to demonstrate that gene regulation does scale with TCR activation, even within cells that are activated. The authors attempted to resolve the issue of digitalness/analogness of the response by performing RNA flow cytometry (e.g. measuring IRF4). It reads like the dynamics range and signal-to-noise ration of detecting irf4 mRNA was insufficient to rule out bimodality. Still the trick of sorting and analyzing single cells does go a long way towards establishing the ability of activated T cells to scale their response to the strength of antigen activation. I would recommend that the histograms or cumulative distribution function for irf4 mRNA should be presented to let readers assess the lack of bimodality. I am surprised that the 10 fold increase (between activation with no peptide activation or with PCC at 10µM – Figure 3A) is not sufficient for resolution. I appreciate the care and additional work carried out since the last submission. The revised manuscript satisfactorily addresses my concerns. We agree with Reviewer #1 that while flow cytometry experiments indicated graded responses of protein expression for selected markers in responding cells, this pattern is not established for mRNA by the RNA-Seq studies of bulk populations of cells. The issue of bulk vs activated cells is also raised by Reviewer #2. To address this concern, we first performed mRNA flow cytometry, in which fluorescent probes are hybridized to target mRNA and analyzed with traditional flow cytometry, resulting in single cell mRNA data. RNA flow experiments demonstrated a graded response in IRF4 mRNA in the responding cells. These results are presented in new Figure 3A and Figure 3—figure supplement 1. A limitation of the RNA flow technology in our hands was that the dynamic range of IRF4 induction was much lower than that observed using RNA-Sequencing, likely due to the technology used to amplify and detect the mRNA target. Therefore, to confirm this observation and look genome-wide, we conducted RNA-sequencing on CD4+ T cells treated as before, but sorted by expression of the activation marker CD69, thereby selectively analyzing responder cells. Although there were interesting differences from RNA-Seq results obtained in the bulk population as elaborated on below, we found that the first principal component again reflected the strength of signaling, with 10μM K99A the leftmost sample along PC1, and 1μM PCC the rightmost sample. This result is shown in new Figure 3C. This is further illustrated by the mean expression levels of mRNAs corresponding to the upper 10% of PC1, which exhibit a clear dependence on dose and affinity (Figure 3D). The dominant functional annotations are associated with protein synthesis and ribosome biogenesis (3E), also consistent with the functional annotations associated with the corresponding genes identified in the bulk RNA-seq experiments (Figure 2E). Examples of genes involved in translational initiation or ribosome biogenesis that exhibit analogue responses are illustrated in Figure 2F and G. We also observed a cluster of genes that exhibited a digital response – i.e., maximal or near maximal expression in the small number of CD69 responding cells recovered after treatment with the low dose of the low affinity peptide (10μM K99A) in comparison to expression in the much larger number of cells recovered after treatment with the high dose of the high affinity ligand (1μM PCC). The top 100 genes from this cluster are illustrated in Figure 3H. Interestingly, this cluster of genes is enriched for functional annotations for immune response (Figure 3I), with representative genes illustrated in Figure 3J. Therefore, analogue signals for these mRNAs in the bulk RNA sequencing experiment primarily reflect differences in frequencies of responding cells. This implies first that the graded levels of immune response genes seen at the protein level in single cells is a result of post-transcriptional regulation, rather than transcriptional regulation. Mechanisms that account for both digital and analogue responses within responsive cells remain to be established, but may be partly due to differences in kinetics, which are beyond the scope of the present studies. Nevertheless, we think that these results substantially strengthen and extend our original conclusions that both the frequency of responding cells and the per- cell strength of response contribute to the population response to antigens of varying concentration and/or affinity. We agree with the major concerns of Reviewer #2, some of which are also raised by Reviewer #1. We would not rank amplitude over frequency, but instead wish to show that amplitude contributes to the strength of signaling in CD4+ T cells. Indeed, in the case of MEK inhibition, frequency is affected. We provide a new panel in revised Figure 7—figure supplement 1 to make this point. However, the single-cell expression level changes of activation markers in response to MEK inhibition (Figure 7—figure supplement 1B) indicate that both frequency and per-cell differences play a role in the total population output. We also reference Albeck et al. in the revised manuscript. We also agree that the manuscript would be strengthened by single cell data corresponding to the bulk mRNA data. To address this concern, we performed mRNA flow cytometry. As detailed in the response to Reviewer #1, these experiments demonstrated a graded response in IRF4 mRNA in CD69-positive cells. The data is included in new Figure 3A. We also considered performing RNA sequencing in individual responding cells. However, this methodology as currently employed is unable to detect most transcripts in a particular cell, let alone provide quantitative measures of transcript abundance. As an alternative, we performed RNA-Seq of responding cells for low and high doses of K99A and PCC. 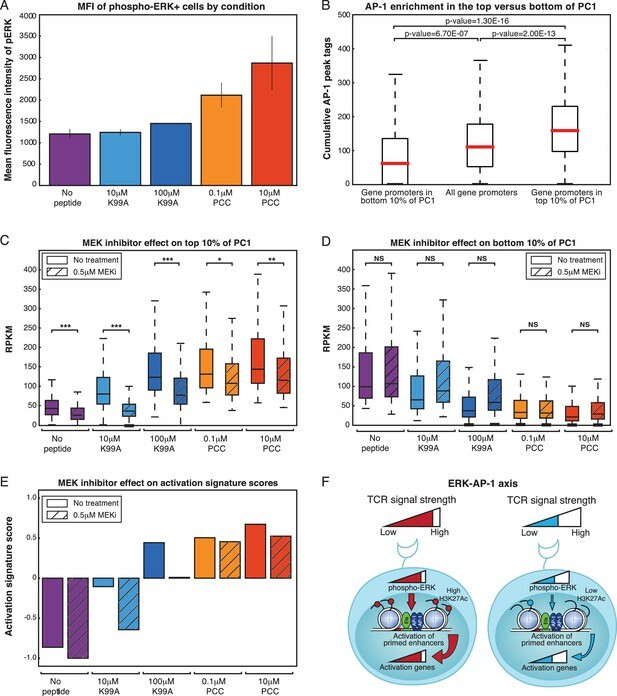 These studies, which are detailed in the response to Reviewer #1, confirmed a strong analogue component of mRNA expression in responding cells (new Figure 3B,C). Genes exhibiting an analogue component are enriched for functional annotations related to protein translation, consistent with our original findings (new Figure 3E). Interestingly, we also identified a cluster of genes exhibiting a digital response in responding cells. These genes are enriched for functional annotations related to immune response (new Figure 3F). Therefore, analogue signals for these mRNAs in the bulk RNA sequencing experiment primarily reflect differences in frequencies of responding cells. This implies first that the graded levels of immune response genes seen at the protein level in single cells is a result of post- transcriptional regulation, rather than transcriptional regulation. We think that these results substantially strengthen and extend our original conclusions that both the frequency of responding cells and the per- cell strength of response contribute to the population response to antigens of varying concentration and/or affinity and we thank Reviewer #2 for prompting these experiments. We thank Reviewer #2 for these comments. We include reference to Marchingo et al. in the revised manuscript. We thank Reviewer #2 for these comments. With regard to a least squares regression analysis, the inbred strain data was derived from publicly available ImmGen data, which unfortunately does not include stimulated cells. Using our five conditions would give us too few conditions for the number of variables being tested. We agree that while acquiring stimulation data across multiple doses or peptides for the 39 inbred strains is outside the scope of this study, our findings do suggest an interesting approach to using strains to tease out the relative contributions of dose and affinity to strength of activation. In order to better separate the role of frequency from that of amplitude of signal, we conducted single-cell mRNA flow cytometry and sorted RNA-seq, as described above. In addition, to further deconvolute the contributors to strength of activation, we segmented the genes in PC1 according to expression level as suggested by Reviewer #3. These analyses demonstrate that the response to the MEK inhibitor as well as AP-1 binding frequency are not dependent on the expression level of the genes in question (See responses to Reviewer #3 below). To investigate the effect of expression level, we took subsets of the top and bottom genes according to RPKM ranges. This greatly reduced the number of genes and related entities that could be compared in any given set, reducing the statistical significance of any conclusions. Nonetheless, RPKM did not have a qualitative effect on the associations found. 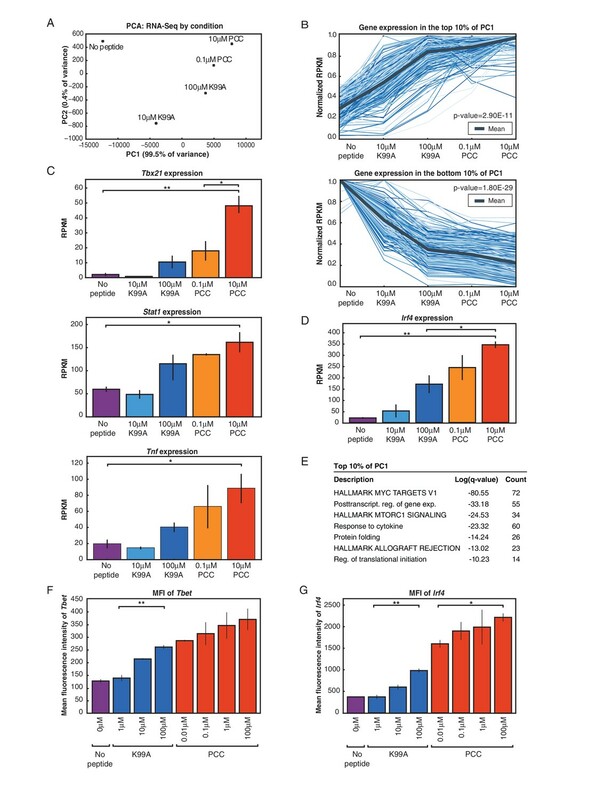 As can be seen in new Figure 7—figure supplements 2 and 3, AP-1 correlates with the PC1 segment across RPKM buckets, and the effect of MEKi on PC1 segments is likewise consistent across buckets. The most important aspect of the activation score is that it is multidimensional and incorporates information on a broad spectrum of genes that can become activated in response to T cell receptor ligation. In contrast, while specific activation markers provide information on functionally important molecules, they are typically considered to be ‘positive’ or ‘negative’ and do not necessarily reflect the global state of activation. For example, CD69-positive cells responding to the low affinity peptide have a lower activation score than CD69-positive cells responding to the high affinity peptide. We found this to be the case regardless of whether we used bulk population RNA-Seq data or RNA-Seq data obtained from responding cells. This is mostly due to lower levels of expression of genes required for protein translation and ribosomal biogenesis, which are presumably required for proliferation and various T cell effector functions. Thus the activation score provides additional information that is not obtained through measurement of well-established activation markers. As to T cell specific terms, some did indeed appear in the GO list, but ontology analysis is a numbers game; there are fewer T cell specific genes among the PC1 set than metabolic and biosynthetic process genes, resulting in immune terms being pushed farther down the list. Several lymphocyte terms- specific terms achieved significant Benjamini-adjusted P-values but were not included in the original table. One problem we became aware of during preparation of the revised version of the manuscript is that the DAVID tool for gene ontology has not been updated in 6 years. We therefore repeated the GO analysis using Metascape, which is updated on a continuous basis. The results are qualitatively similar, but this analysis captures more annotations. Terms related to protein synthesis still dominate the top of the list, but many terms related to immune response are also captured. These new results are provided in the revised Figure 2E. In addition, we performed RNA-Seq of responding (CD69+) cells to confirm results of bulk RNA Seq experiments as requested by Reviewers #1 and #2. This experiment also identified biosynthetic process genes as being the most significant in PC1, which demonstrated an analogue response (new Figure 3D). However, we also identified a ‘digital’ cluster in the responding population of cells that was not apparent in the bulk sequencing experiment. Interestingly, this cluster of genes is much more enriched for immune response genes, illustrated in new Figure 3F. As now described in methods, we ran GO analysis on Metascape using default parameters for transcriptome background and the q statistic for adjusting p-values for multiple testing. We share the reviewer’s interest in the Th1/Th2 dichotomy, and indeed we looked at Gata3 across the conditions via flow cytometry, and we compared expression of many different markers of Th2 cells in the RNA-seq data. We did not observe any significant expression of Gata3 in any of the conditions via intra-cellular flow cytometry. Similarly, all of the Th2 markers we looked at in the high- throughput data showed low RPKM values as well as expression changes that were not significant or were inconsistent across replicates. We posit that this difference versus other references may be the result of the particular low-affinity peptide chosen, as low-affinity responses seem to vary widely in the end phenotype. We note in the revised Discussion that we observe no evidence of Th1/Th2 skewing. Figure 3E is derived from public data published by the ImmGen Consortium. According to the data submission (http://www.ncbi.nlm.nih.gov/geo/query/acc.cgi?acc=GSE60337), the cells were sorted to be CD3+CD4+CD62L+, implying that memory cell contamination was likely minimal. Confirmation of bulk RNA-Seq results using sorted cells was performed for no peptide CD69 negative cells and CD69+ cells for low and high doses of K99A and PCC. All flow cytometry results shown are representative of at least two biological replicates, and the results shown in Figure 1 were reflected with samples held out of each high-throughput sequencing assay. Venn Diagrams across all five of the conditions prove visually hard to interpret. We instead provide below a table of the pairwise overlap between the peaks called with histone mark. In each cell is the count of peaks where each condition shown has at least 40 tags (normalized). In the diagonal is the total number of peaks with at least 40 tags for the given condition. We include these tables as Tables 1 and 2. As discussed in the manuscript, the vast majority of peaks are shared, especially for H3K4me2. Good point – it is easy to forget that not everyone spends all day looking at motif sequence logos. In this case, the motifs are derived from the H3K27Ac chip, and are not specific to any single AP-1 family member. The motif finding software applied the BATF label to this particular motif because its original source for that motif happened to be a BATF chip. However, this motif is identical to the generic AP-1 motif. We therefore changed the name of this motif in Figure 4 (now Figure 5) to an AP-1 motif and corresponding text for ease of interpretation. Figure 4H is also confusing. Readers may not understand right away that the legend indicates solid and dashed lines. It is an important piece of data, so the authors should make it easier for readers to get this right away. The choice of colors is also confusing (purple refers to Batf and CTCF). This figure is more complicated than it needs to be. Is 0.1 μm PCC used? Is 1 μm PCC not used in Figure A? The authors should check all the figures for labeling errors, e.g. : Figure 1A, B: green 100 μm curve is labeled PCC instead of K99A. Figure 1E: x-axis labels are missing decimal points. The choice of CTCF is also of interest, insofar as one would not necessarily expect that it would be a TF that would be responsive to graded signals. We clarified the legend in Figure 5H, Figure 5—figure supplement 1H and 1I by making the dashing more clear. We have also done another pass through the figure labels and corrected the errors noted by the Reviewer. As to the choice of CTCF, the goal was to choose a TF that would not be responsive, as signal at any responsive TF is likely to be heavily confounded by the fact that enhancers are highly interconnected and multiply bound. CTCF is thus a more reliable negative control. H. Genome-wide, deposition of H3K27Ac, a marker of transcription factor activity, reflects increasing TCR signal strength at the binding sites of AP-1 family members, including Batf. Deposition of H3K27Ac at CTCF, a transcription factor that is not expected to be signal responsive, is shown for comparison in the dashed lines. We did not observe consistent GATA3 expression as noted above. To address this concern and a corresponding concern of Reviewer 2 we now provide RNA-flow data for β actin as a loading control. We added panels to Figure 3—figure supplement 1 illustrating Cumulative Distribution Plots for Irf4 and β actin (panels B and C) and provide a Mean Fluorescence Intensity plot for β actin (panel D), demonstrating that, in contrast to Irf4, β actin mRNA expression is constant across treatment conditions when measured by this assay. These results are also consistent with the independent RNA-Seq experiments of CD69+ cells. We thank reviewer 1 for requesting that we take another look at Huang et al. with respect to both the digital response point and the increased rates of protein production in blasts and memory cells in comparison to naïve cells. This difference could very well be explained by the induction of the protein biosynthetic machinery observed in our studies and is now pointed out in the discussion. In addition, we also note that the RNA-seq analysis of CD69+ cells identified a digital cluster of genes that includes Tnf and Il2. Bar graphs for these and additional representative mRNAs are now included in Figure 3—figure supplement 1, panel E. Thus, our findings are consistent with those of Huang et al. with respect to both changes in synthetic capacity and digital induction of Tnf and Il2. It will be of interest to further investigate mechanisms enabling gene-specific analogue or digital responses within the same cell. We agree that the single time point eliminates the potential for registering cumulative effects of weak signaling and have added this point to the Discussion. To address this concern and a corresponding concern of Reviewer 1 we now provide Cumulative Distribution Plots for Irf4 and β actin (Figure 3—figure supplement 1, panels B and C) and provide a Mean Fluorescence Intensity plot for β actin (panel D), demonstrating that, in contrast to Irf4, β actin mRNA expression is constant across treatment conditions when measured by this assay. These results are also consistent with the independent RNA-Seq experiments of CD69+ cells. The authors would like to thank Leslie Van Ael and David Allison for assistance with preparation of the manuscript. These studies were primarily supported by NIH grants DK091183, CA17390, DK063491, R01-AI103440, and the San Diego Center for Systems Biology (GM085764). KAA was supported by F31-AI112269 (NIAID); ELS was supported by K01-DK095008 (NIDDK); TDT was supported by T32-CA009523 (NIH); and DG was supported by a Canadian Institutes of Health Research Fellowship. The authors declare no conflict of interest. Animal experimentation: All animal experiments were performed in compliance with the ethical standards set forth by UC San Diego's Institutional Annual Care and Use Committee (IUCAC)to minimize pain and suffering under protocol S01015. © 2016, Allison et al.